Patients with respiratory diseases or anxiety frequently complain about dyspnea, which may be partly related to chronic tension of respiratory muscles and/or dynamic hyperinflation. 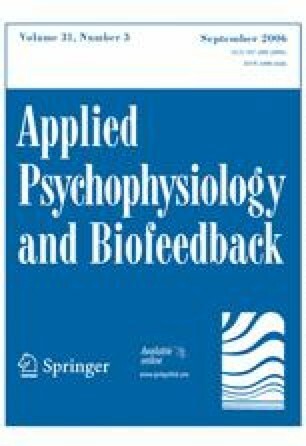 In two experiments we tested a biofeedback technique that recorded electromyographic (EMG) activity from a bipolar surface electrode placement over the right external intercostal muscles with visual signal feedback. Healthy participants were tested in their ability to alter the signal. Heart rate was measured continuously throughout training trials. In the second experiment, dyspnea was rated on a modified Borg scale after each trial. Participants were able to increase their EMG activity considerably while heart rate and dyspnea increased substantially. Changes in EMG activity were achieved mostly by manipulating accessory muscle tension and/or altering breathing pattern. Thus, the technique is capable of altering respiratory muscle tension and associated dyspnea. Further studies may test the procedure as a relaxation technique in patients with respiratory disease or anxiety. The authors want to thank Nicole Wedell for helping with the data reduction procedures.